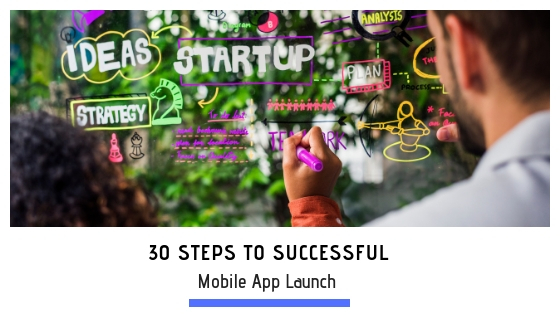 Launching a mobile app can be difficult, confusing, and will test your patience on occasion. However, if you follow these 30 steps, some of those stresses will be eased, if not eliminated! Identify Target Audience: Decide who will be using your app and why they need your app. Register Domain and Landing Page: Have your app development team register a domain and create an app name in app store & landing page for your app. This holds your “spot” in the app waiting room. Claim Social Media Handles: Create social media pages and claim hashtags that are directly related to your app. Create a Promo Video: Give a one-minute pitch about your app in the form of a promo video so that users can get a taste of what your app will be like. Find an Online Niche: There are so many chat rooms and forums out there, so you are sure to find one that fits in your app’s “niche.” Advertise and conduct surveys in these forums to drum up anticipation for your app’s launch. Find Reporters and Influencers: Locate any person that can give your app an edge once it is launched. This can be by advertising the app (reporters) or endorsing it (influencers). Research App Submission Guidelines: Not every platform is going to have the same submission guidelines. So, be sure you know all the guidelines and that your app follows them to avoid launch delays or cancellations. Identify Success Metrics: Discover what will push your app into the winner’s circle. Also, identify successful marketing and monetizing techniques that can be used prior to and after launch. Build a Feedback Loop: Make sure you have a way for your users to send feedback about your app. Their suggestions and concerns will help you improve the user’s experience. Plan a Beta Release: A beta release is a time when the app is made accessible to a small group of users for the purpose of testing mechanics and providing feedback. Compile a Press Kit: Create a directory of your app’s assets, including links to social media pages, website, etc. Sending a press kit to reporters, influencers, bloggers and journalists will help maximize the odds of media coverage for your app’s launch. Send a Pitch: Now that you have identified reporters, influencers, bloggers, and journalists that may be interested in covering/endorsing your app send them a pitch email that briefly provides information about the app and links to its press kit. Decide on App’s Messaging Descriptions: Take feedback from beta tests and discussion forums to make any necessary changes to the app’s language and wording. Identify and Install Software: Beta testers may run across technical issues in your app that can be fixed by installing a software component. Be sure these issues are fixed and that the app is ready to go by launch time. Submit App: Submit your app to the app store(s) of your choice. Once approved, your app will be live for public download. Notify Email List: Send out an email to all your contacts letting them know the app is available for download. Notify the Press: Send emails to all reporters, influencers, bloggers, and journalists you have been in contact with about the app’s launch. Utilize an Analysis Software: One of the best pieces of software you can invest in is an app monitoring and analysis system. Use this data to identify what parts of the app are drawing in users and which are not. Then make changes as needed. Monitor: Check feedback and analyze user retention and interactivity with the app. Assess customer satisfaction through discussion forums, social media pages, etc. Interact with First Customers: Taking the time to engage with the first customers that downloaded your app can go a long way. Ask for suggestions, find out what they like best about the app, and thank them for being among the first to give your app a try. Encourage Reviews: Provide relevant review prompts to users for instant feedback. Let them feel their voices are being heard! Monitor App Store Stats: Be sure to keep an eye on the download growth (or decline) in the app store(s). Also, monitor the number of users uninstalling the app. Release an Update: Not every app is going to work perfectly upon its first release. Make notes of bugs that need to be fixed in the app, then release an update to fix these bugs as soon as possible. Add to Your Performance Stats: Continue to add data to your performance software dashboard so the health of your app can be monitored quickly and thoroughly. Customer Requests: Organize and prioritize customer requests about app issues or improvements that should be made. Set Your 3-Month Product Road Map: You can’t please everyone and stay true to your app’s purpose. Evaluate your product and decide how to bring it more in line with your vision after customer suggestions have been considered. Incentives: Break out the incentives to retain your user’s attention. The hype of the launch is over, so bring your user back to your app every day by offering an incentive or two in exchange for their interactivity. Win Referrals: If you have an app that is satisfying your customers and retaining their usage, you are winning referrals! When the users are happy, they will want to share your app with all their friends! Push Notifications: Review your data, specifically the average user’s habits, and decide what improvements can be made with push notifications. Evaluate Performance: Continue to evaluate all data and feedback. Make improvements when needed. Bottom line: When you launch a mobile app, the work doesn’t stop at launch day. That’s why it’s important to team up with a professional, dedicated development company. Gomeeki is one of those companies that go beyond launch day by continuing to monitor and make improvements to your app. We want to make sure your app succeeds. Contact Gomeeki today for more information!